The Museum has an active collection department. It is our goal to preserve what still remains of Southern Arizona transportation artifacts and photos. 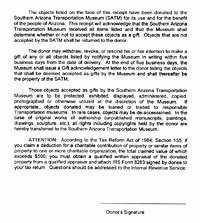 If you would like to donate artifacts or photographs to the Museum’s collection, please contact the Museum, 520-623-2223. If you are interested in helping the Museum catalog the collection of artifacts, please contact us. 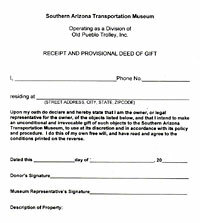 All artifacts must be released to the Museum through the signing of a Deed of Gift. Do not leave artifacts with volunteers. Artifacts that are not accompanied by a signed Deed of Gift form will be returned. Read up on the Deed of Gift form before signing it. Would you like to help us develop a rotating exhibit by loaning us your interesting artifacts? Please contact the Museum (520-623-2223) to learn more about our Loan Program and how independent researchers are important to research and presentations at the Museum.